An MapView control provides an embeddable map interface, similar to the one provided by the Maps application. You use this control as-is to display map information and to manipulate the map contents from your application. You can center the map on a given coordinate, specify the size of the area you want to display, and annotate the map with custom information. To display annotation and details related to annotation you need to configure the webservice for the maps and call the web service on the load of the view. Now we will discuss in detail related to properties and actions of the mapview. Tapping on mapview will open the following window as shown below. 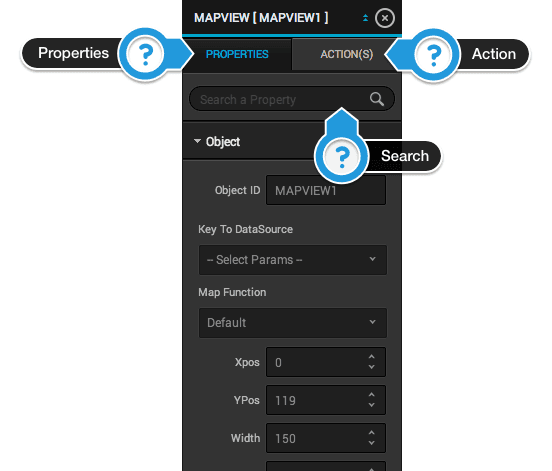 In properties tab you can change any property of mapview and even can easily search using the search bar. To configure various events related to map view tap on action and configure it. Define how the map will work. Default : This will normally display the map and will show annotation if configured. Address Locator : This will display your current location . Global Location Search : This option will be used to search any location globally using search bar control. Local Search : This option will be used to search particular annotation from the group of annotations using search bar control. Map Type : The type of data displayed by the map view. Standard : Displays a street map that shows the position of all roads and some road names. Satellite : Displays satellite imagery of the area. Hybrid : Displays a satellite image of the area with road and road name information layered on top. Show user location : A Boolean value indicating whether the map should try to display the user’s location. Value - bool : The default value of this property is NO. Zoom Enabled : A Boolean value that determines whether the user may use pinch gestures to zoom in and out of the map. Value - bool : This property controls only user interactions with the map. If you set the value of this property to NO, you may still change the zoom level programmatically by changing the value in the region property. Scroll Enabled : A Boolean value that determines whether the user may scroll around the map. Key Name to Location Latitude : Set the latitude value of the annotation through the data coming from server. Key Name to Location Longitude : Set the longitude value of the annotation through the data coming from server. Direction Path Color : The color of the path between two annotations. Value : To change the path color, click on the box will open the color picker and choose the color. Key Name to Location Title : Set the location title of the annotation through the data coming from server. Key Name to Location Description : Set the location description of the annotation through the data coming from server. Pin Color : Set the pin color of the annotation or give custom annotation image name. Color : Set the color of the annotation. For e.g., red, green and purple. Image : Set the image of the annotation. For e.g., annotation.png. Annotation View Nib Name : The object id of the view that will be displayed when tapped on the annotation. Value - String : Set the object ID of the annotation view that is inside the mapview. Should show all annotations : A boolean value to allow to display all annotations. Show detail disclosure buttons : A boolean value to display button on the annotation view. Left Call out accessory view id : The view to be displayed on the left side of the callout view. Value - bool : Select any option from the dropdown list. Right Call out accessory view id : The view to be displayed on the right side of the callout view. As shown in above figure the Map view’s actions description is given below. Load : The action related to this event will be called when map view is loaded. Detail Disclosure Tapped : The action related to this event will be called when detail disclosure button on the callout view will tapped. The AnnotationView control is responsible for presenting annotations visually in a map view. When an annotation’s coordinate point is in the visible region, the map view displays a corresponding annotation view. Annotation views support the concept of a selection state, which determines whether the view is unselected, selected, or selected and displaying a standard callout view. The user toggles between the selection states through interactions with the annotation view. In the unselected state, the annotation view is displayed but not highlighted. In the selected state, the annotation is highlighted but the callout is not displayed. And finally, the annotation can be displayed both with a highlight and a callout. The callout view displays additional information such as a title string and controls for viewing more information. The title information is provided by the annotation object but your annotation view is responsible for providing any custom controls. As shown in above figure the Map Annotation view’s actions are almost similar to view‘s actions which are discussed in Controls - 1 Views document.